Bloomingdales has Longchamp Large Splash Shoulder Tote Sale. Only $126.00 after coupon code BROWNBAG (Reg. $225) with Free Shipping for Loyalists (free to sign-up). 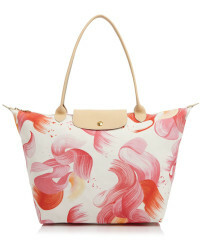 Longchamp's signature Le Pliage tote makes a splash, updated with an artful wave print.